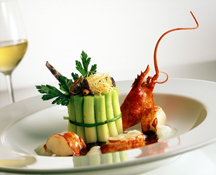 Luxury Experience Magazine met Chef Andreas Mayer of Austria at the 15th St. Moritz Gourmet Festival in Switzerland in January 2008 where he was one of the featured chefs. 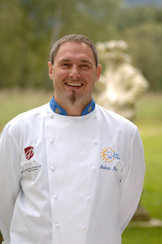 He holds the distinction of Chef of the Year 2007 for Austria, and his Restaurant MAYER's is rated 2 Michelin stars. 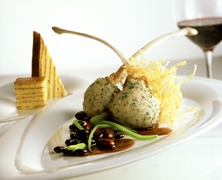 After tasting his cuisine, we convinced him to share a few of his recipes with Luxury Experience Magazine. He has graciously provided recipes for a delectable three-course menu. Method: Bring water in a large pot to a boil. Add the chamomile and the salt, then add the lobsters and cook for 5-6 minutes. Carefully take out the water and let cool. Method: Peel the asparagus stalks and place 5 stalks on a sheet of foil. Season the asparagus with salt, pepper, sugar, lemon, chervil, and melted butter. Cover with another sheet of foil and seal the package. Repeat with the rest of the asparagus, creating 4 packages in total. Place the foil packages on a baking sheet in a pre-heated 200° C (400° F) oven on the lowest rung of the oven. Bake for 40-45 minutes. Remove the asparagus from the oven and let rest. Method: Add the port wine and the red wine to a pot and simmer to reduce to ¼. Bind together with the flour, sugar, and cold butter. Method: Add the potatoes to salted water with the thyme and cumin and bring to a boil. Cook until potatoes are tender and strain. Pass the potatoes through a rice-mill and let set for approximately 10 minutes. In a large bowl, mix the crème fraiche with the butter and the egg yolks. Add the potatoes. Beat the egg whites and then add to the crème fraiche mixture. Season the mixture with salt, pepper, and nutmeg. Butter a 4-cm (1.5 inch) deep metal baking sheet and cover with a 0.5 cm (0.2 inch) layer of the potato mixture and place under a Salamander (or broiler) until golden brown. Add another 0.5 cm layer of the potato mixture and place under a Salamander until golden brown. Repeat and sprinkle the last layer with the Parmesan and place under the Salamander until golden brown. Let cool and cut into desired form and shape. Just before serving, place in a pre-heated oven to heat and then briefly under the Salamander. Method: Grind the turkey with the cream and wine; season to taste with the spices. Season the veal chops on both sides with pepper and sear quickly. Add the meat drippings to the ground turkey mixture and place a layer of the mixture on the chops, and smooth the mixture with the back of a wet spoon. Roast in an oven for approximately 10 minutes. Method: Mix the beans with the butter, salt, and pepper. Method: Sauté the shallots in the butter with the Madeira, and reduce by half. Add the veal stock and simmer to reduce by half. Add the rosemary and garlic and let rest for 10 minutes. Pass through a sieve, and then add the cold butter, and season to taste. Method: Slice the potatoes on a mandolin into thin disks. Dry with a kitchen towel and deep-fry in oil until golden brown. Fry the thyme in the same oil. Method: Add the sugar and water to a pot and bring to a boil. Add the lemon juice and raspberry sorbet and mix together. Put the mixture in an ice cream maker and freeze according to directions. Method: Place the gelatin leaves in a little cold water to soften; let rest for 2 minutes. Then add the gelatin to the raspberry purée, sugar, and Raspberry Eau de Vie. Let cool over a dish of ice, and then carefully add the whipped cream. Refrigerate until serving time. Method: Add all ingredients to a pot except the icing and oil, and bring to a boil. When the mixture reaches 85° C (185 ° F), remove from the heat and place in an ice cream machine and freeze. When the mixture is very cold, remove and place the mixture onto a chilled metal baking sheet and place in the freezer. Let mixture freeze for a few minutes on the baking sheet, then remove and cut the mixture into rounds (or other shapes) with a cookie cutter. Return the rounds to the freezer until firm, and then cover each with the icing mixed with vegetable oil and return to the freezer until serving time. Presentation: Place a chocolate sheet on each of 4 plates. Top with raspberries in a circle on the chocolate sheets. Fill in the circles with the raspberry cream. Top each with another sheet of chocolate, and another circle of raspberries and raspberry cream. 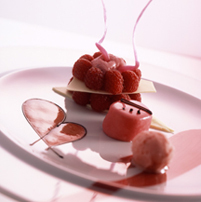 Serve a scoop of Raspberry Sorbet on the side of the plate along with the Ice Cream Confection and the Raspberry Sauce.